Ipomoea indica, called koaliʻawa, is the more common of the two morning-glory species native to Kure Atoll. It is a vigorous, tender perennial vine native to tropical habitats throughout the world. On Kure, it is common in the central plain and makes a lovely groundcover. 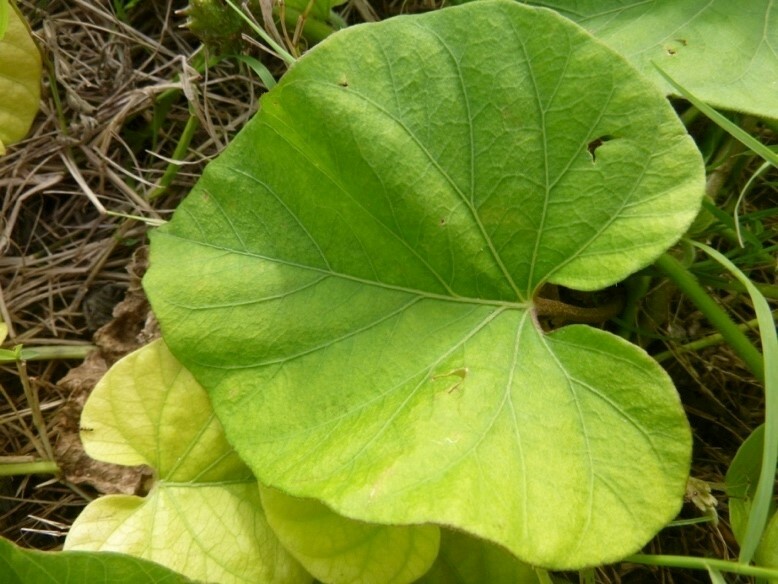 The leaves are large, broadly heart-shaped, and have a pointed tip. The flowers are varying shades of purple. It grows vigorously though out the year. He is like a morning glory, twisting this way and that. The traditional proverb above perfectly expresses the nature of this vine as this vine can be seen on Kure doing twists and turns all throughout the central plain, sending runners out from a place with a lot of water and soil, and roots at the nodes when there is an opportunity. The unrooted vines are usually tossed around when the wind changes direction—a very common occurrence on Kure due to the cyclonic patterns of the storms that move across the North Pacific. So if there are any poʻe koaliʻawa (Koaliʻawa-type people) out there–root your vines while you can or get blown away(!). At the onset of the field camps on Kure, this plant was wrapped around the leaking cistern that was standing there since the Coast Guard days. The plant was moved from the cistern when it was discovered that the roots were starting to crack and compromise the structural integrity of an important freshwater resource for the field camps. Learning from this event and another USCG site on Kure, the strategy for the restoration of this plant is to begin where the koaliʻawa has access to water. A wide variety of insects are found in koali ʻawa, making it good foraging grounds for shorebirds and Laysan ducks. The vines are collected by ʻiwa (frigate birds) and manu ʻā (red-footed boobies) during nesting season. ʻIwa birds swoop down and grab a vine with their long sharp beaks without landing. Manu ʻā land and take their time choosing vines to carry in their beaks back to their nests where they weave them into the nest. This activity is often observed in camp at breakfast and dinner. Koaliʻawa shares space well with the other native restoration plants—naupaka, kāwelu, ʻalena, and nohu, to name a few. This plant has been successful mostly where all the water runs off and collects at a low point. This is usually in areas like the base of the dune structures or at the edges and sloped sides of the runway. From there, it can share the water with the whole plant as it grows from the source out to the new territory. Due to its strong need for water and its ability to coexist with the other native plants, it is currently the main candidate to displace the non-natives within the central area of Kure, called the central plain, or Kula manu. Deliberate efforts are made to outplant in locations where the highly invasive plant Lobularia maritima is in hopes that it will be replaced by this native water hog.